Pericarditis is a condition in which the pericardium (the protective elastic sac that encloses the heart), becomes inflamed. Often this inflammation is relatively mild and transient. But in some cases, pericarditis can lead to severe illness and even to cardiac damage. Pericarditis can be caused by a number of conditions, including infection, heart attack, autoimmune disorders, chest trauma, cancer, kidney failure, or drugs. Infections that can produce pericarditis include viral infections, bacterial infections, tuberculosis, and fungal infections. People with HIV/AIDS frequently develop infections that produce pericarditis. Autoimmune disorders that can cause pericarditis include rheumatoid arthritis, lupus, and scleroderma. Pericarditis occurs in up to 15% of patients who have acute heart attacks. There is also a late form of post-heart-attack pericarditis, called Dressler's syndrome, that occurs weeks to months after the heart attack. Some of the drugs that can produce pericarditis include procainamide, hydralazine, phenytoin, and isoniazid. Many forms of cancer can metastasize (spread) to the pericardium, and produce pericarditis. In many cases, no definite cause for pericarditis can be identified — this is called "idiopathic" pericarditis. The most common symptom caused by pericarditis is chest pain. The pain can be severe and is often made worse by changing position or by taking a deep breath. People with pericarditis may also develop dyspnea (shortness of breath) and fever. Doctors can usually diagnose pericarditis by taking a careful medical history, performing a physical examination, and doing an electrocardiogram (which shows characteristic changes). Sometimes an echocardiogram can be helpful in making the diagnosis. 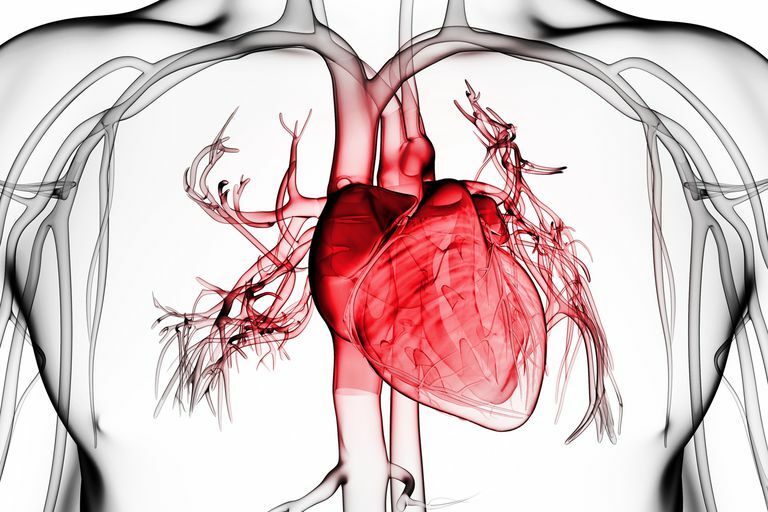 What Complications Can Occur With Pericarditis? While pericarditis usually resolves within a few days or a few weeks, three complications can occur. These are cardiac tamponade, chronic pericarditis, or constrictive pericarditis. Tamponade occurs when fluid accumulating in the pericardial sac (a condition called pericardial effusion ) prevents the heart from filling completely. When this happens, the blood pressure drops and the lungs become congested, often leading to weakness, dizziness, lightheadedness, and extreme dyspnea. Without adequate treatment, cardiac tamponade may become fatal. The diagnosis of tamponade is made with an echocardiogram. Chronic pericarditis is said to be present when the pericardial inflammation does not resolve within a few weeks. It can be associated with all the symptoms of acute pericarditis, and in addition, is often accompanied by particularly large pericardial effusions. Constrictive pericarditis occurs when a chronically inflamed pericardial sac stiffens and loses its elasticity, which (similar to tamponade) prevents the heart from filling completely. The symptoms are the same as with tamponade but usually have a much more gradual onset. The management of acute pericarditis is aimed at identifying and treating the underlying cause. The symptoms can usually be improved with anti-inflammatory drugs (usually non-steroidal anti-inflammatory drugs, but sometimes steroid therapy is necessary), and analgesics. Most cases of acute pericarditis resolve within a few weeks and leave no permanent cardiac problems. Cardiac tamponade is treated by draining the fluid from the pericardial sac, usually through a tiny catheter. Removing the fluid relieves the pressure on the heart, and restores normal cardiac function almost immediately. Chronic pericarditis is treated by aggressively treating the underlying inflammatory condition, and draining the large pericardial effusion that is often present. If pericardial effusions continue to recur, surgery can be done to create a permanent opening (a so-called pericardial window), that allows the fluid to drain from the pericardial sac, thus preventing tamponade. Constrictive pericarditis can be a very difficult therapeutic problem. Symptoms can be treated with bed rest, diuretics, and digitalis, but definitive treatment requires surgery to strip the stiffened pericardial lining away from the heart. This surgery is often quite extensive and carries significant risk. Pericarditis is often a self-limited condition that resolves when the underlying medical problem is treated. In some cases, however, pericarditis can become chronic and can lead to more serious problems. As is the case with any cardiac problem, it is important for anyone with pericarditis to receive good medical care. Adler Y, Charron P, Imazio M, et al. 2015 ESC Guidelines For The Diagnosis And Management Of Pericardial Diseases: The Task Force for the Diagnosis and Management of Pericardial Diseases of the European Society of Cardiology (ESC)Endorsed by: The European Association for Cardio-Thoracic Surgery (EACTS). Eur Heart J 2015; 36:2921.